In Oklahoma City — where QuiBids’ office is located — the summers can get so brutal that you can bake cookies just by leaving a panful of dough in your car. Last summer was particularly unmerciful, as we hit over 100 degrees Fahrenheit for more than 30 consecutive days. So with spring in full swing and summer soon to come, we recommend preparing for the possibility of another rough heat wave — not by retreating into your house for the summer and throwing gobs of money at your energy bill for air conditioning — but by checking out one of our newest products we’re auctioning off here at QuiBids. It’s a big ol’ Moroccan-style gazebo that’ll keep you cool and (thanks to its one-inch powder-coated aluminum tubing) stand up against real strong winds. And trust us — we Oklahomans know a thing or two about strong winds. Ever seen Twister? We compiled the numbers on the previous 27 auctions for the gazebo and found some interesting numbers and trends. Let’s have a quick look at them, so you can know better what you’re getting into when you step up to the auction block. Though the average final auction price was $9.84, the median was only $6.36. These 27 auctions displayed an unusually large range (from 57 cents to $34.62), so knowing the average will be really helpful. The bulk of the auctions’ final prices were clustered between $1.00 and $6.00, so your odds of the auction ending somewhere in that zone are pretty favorable. We’ll call it the hot zone. Or maybe it isn’t. 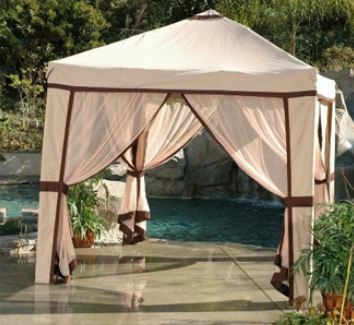 Two users managed to win gazebos for only ten real bids. While both are very impressive wins, even the biggest, clunkiest spenders (one committed 409 bids and another, 371) managed to save at least $68 on the purchase, cost of shipping included. So it’s comforting to know that even if you do find yourself in a shootout, you might as well keep firing — you’re pretty likely to still save some money. It’s also worth noting that, because it’s a particularly large item, you should account for paying a bit extra in shipping charges, as its delivery cost is $14.99. Happy bidding!